Meg has a beautiful "tag tree" in her studio at Crabapple Hill. Large, sweeping swags of twigs are secured in a container. Their branches sweep across a counter top, creating a focal point and arch. 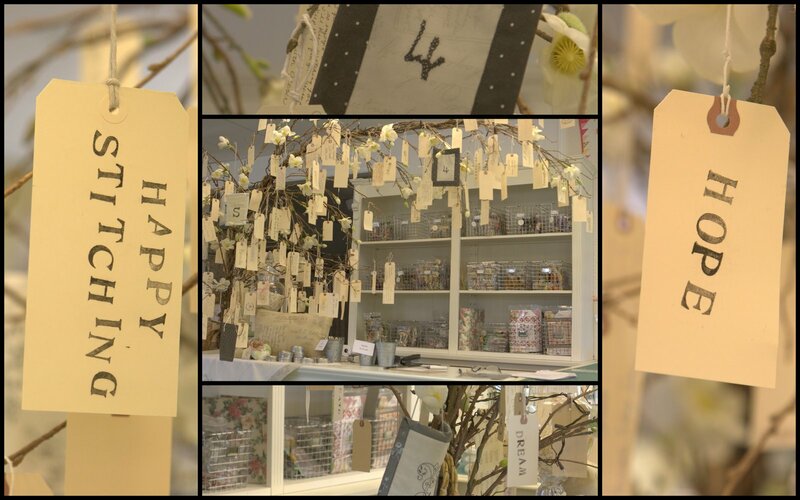 Her tag tree is not only beautiful, but provides a place for written notes and meaningful words to be attached. Manila tags are tied to the branches, each with stamped words, autographs, or notes from friends and clients. Mixed among the tags are samplers of her typeset ornaments. The effect is neutral and serene. The tree holds a plethora of meaningful memories for her. A delightful focal point. Maybe it is time to create a tag tree at home. With twigs gently swagging across a piano, tags signed by guests who come to visit would create an object of interest. 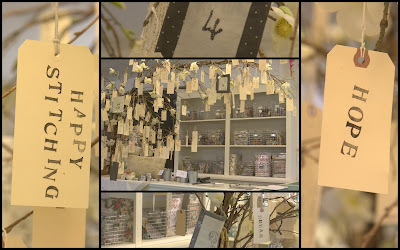 A tag tree at a bridal shower or wedding could be a place to exhibit congratulatory messages from family and friends. Blessings could be written on tags and hung on the swags for a baby shower. And a twig tree could be used in a children's church class as a place to display memory verses after learning. The ideas could keep going on and on. How would you use a tag tree if had one? Will you be making one soon? I love just seeing words around the house and do hang them in different places. I love finding them in books and using them for bookmarks, or tieing them to a gift with a special message hand written. Thanks for sharing the tag tree idea. I've wanted to do this for a long time and just never have. I enjoyed seeing this tag tree and think it's great. If nothing else, it's a conversation starter. You have such a gorgeous blog and your photography is so EXTREMELY impressive!! Thank you for showing my tag tree...and for stopping by the studio to visit!